Ray Whyte is a Canadian handyman with a Prowler. He’s put together a 122 page book (PDF) available for free on his website. The book is well worth the download and probably even a donation as requested. There are a lot of pictures, personal anecdotes, tips and tricks, suggestions, and just plain good advice. Whether you want to see how to weld on an additional entry step or sew together a tire cover, Ray has his story, with pictures and sometimes links to YouTube videos. Books like this are enjoyable for the pictures, the sharing of common experiences, and the many ideas to peruse and consider. The price on this one can’t be beat. The rangers and the campground host both remarked on the abundance of aluminum that weekend. Photo galleries and seminar notes are up at the rally page. Check it out! There are a few changes in the remaining SNU 2015 rally schedule. * Thursday September 24 – Sunday 27 2015 the rally location has changed from Obsidian Dome to Glass Creek Campground. 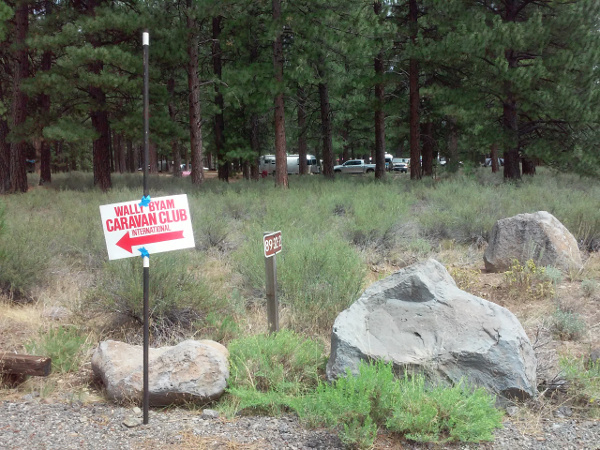 Glass Creek Campground is 4 miles further south of the the turn off to Obsidian on hwy 395. It is an NFS free, semi dispersed campground. It is more accessible than Obsidian, near Glass Creek and has access to hiking and off road trails. Here are some links to the Glass Creek area and campground. * Thursday October 29, 2015 – Sunday November 1, 2015 are the dates for the SNU rally at Death Valley Mesquite campground. This Rally is hosted by Don and Gail and they have a lot of ideas for special activities. * Saturday November 14, 2015 – the Luncheon will now be held at El Charro Avita in Carson City. The original site has new owners and the place is no longer suitable for an SNU luncheon. The problem of under inflated tires has become an issue big enough for the government to require many new vehicles to have tire pressure monitoring systems. Under inflated tires are inefficient and can lead to traumatic tire failure. This is why the Les Schwab tire store leaving me with tires below pressures specified on the vehicle driver door placard and below the tire manufacturer’s recommendations for the load on the tire were a concern. Since tire pressure is to be determined when the air in the tire is at ambient air temperatures, taking the vehicle down to the tire store to get pressures checked is not usually a good idea. A tire that has been run a few miles or has had tires sitting in the sun should be considered a tire in use. About all you can do with tires that are in use is to realize that a hot tire is telling you it needs more air. Never let air out of a tire except when you can measure the pressure when you are sure the tire and the air inside it are at the same temperature as the air temperature in the shade. Manufacturers take into account diurnal temperature changes and other factors when they make recommendations for tire pressure so you should only adjust pressures with the tires at at ambient conditions and not service conditions. The best indicator of correct tire pressure is tire temperature. The air pressure acts like three springs inside the tire holding the car up. Overinflation causes the center to push too hard, creating excessive heat. Too little pressure causes insufficient push and reduced heat in the center. Our goal is to have the entire width of the tire share the workload evenly. If one section of the tire is overworked it will overheat and wear prematurely. Tire temperatures will never be perfectly even across the tire. But if a linear reading within 10 degrees can be achieved, far greater tire wear and performance will result. Even more specific is a racing cars website. Using an infrared thermometer, you will get a surface reading that may be 10-40 degrees cooler than temperatures taken with a probe type thermocouple. Three readings are taken on each tire: inner tread, center tread and outer tread. Inner and outer readings are taken one inch from the tread shoulder. Write down the readings for evaluation. Check with your tire manufacturer to find the recommended operating temperature for your tires. A typical operating range for a DOT-R tire is 180 ˚F to 200 ˚F with a hot pressure of 37 to 43 psi. You want to see no more than 20 degrees difference in temperatures across the tread, with the inside being slightly hotter than the outside. Another website with guidelines for a hot tire is the Bridgestone page on airplane tires. A “Hot Tire” is defined to be a tire heated by aircraft operation (Braking) or by exposure to sunlight and having a surface temperatrure higher than ambient temperature by at least 30°C. A “Hot Tire” may also result from operating with an abnormally large tire deflection. Tires are not recommended for further use when tire surface temperature exceeds 225°F (107°C), or when brake heat creates temperatures that exceed 300°F (149°C) at points where the tire is in contact with the wheel surface. Tire wear isn’t usually an issue with RV tires. A bit of over-inflation is better than trying to get an ‘exactly right’ pressure according to some chart or whatnot. Trailer tires, especially, should be inflated to the max sidewall indicated pressure. Extra wear near the center of the tread from an inflation margin of safety is likely to be minimal over the life of the tire in most RV use. A stop for a walk-around every couple of hours is not only good for avoiding DVT and muscle issues but also a good time for a quick scan of tires and hubs with an IR thermometer. You don’t need to get as specific as in the racing car website but you should look for anomalies – one tire significantly different from the others – and tires that are quite a bit warmer than air temperatures. A good TPMS or tire pressure monitoring system will help you avoid problems. It will warn you before you start if any of your tires need air. On the road, you will get early warning of tire failures so you can pull off the road and minimize damage from a flat tire. Monitoring the TPMS readout will familiarize you with how your tires normally respond in service as they warm up and their pressure increases. Start your RV maintenance and safety procedures with proper tire inflation.